Logistics is the only one business which is the basic requirement of all the other businesses. Today every business has a need of transportation. Every business needs their products to come in the reach of general public. As it is known that the transportation basically relies on the routes. So in that case GIS and logistics are the counterparts of one coin. GIS would be the most optimum tool for the efficient logistics services. So, lets check how can we use GIS in Logistics. Logistics is a service providing industry, which provides services to the other business and to the individuals as well. The main service provided by the Logistics is Transportation. We need transportation every now and then. But these logistics services are highly used by the product based industries. 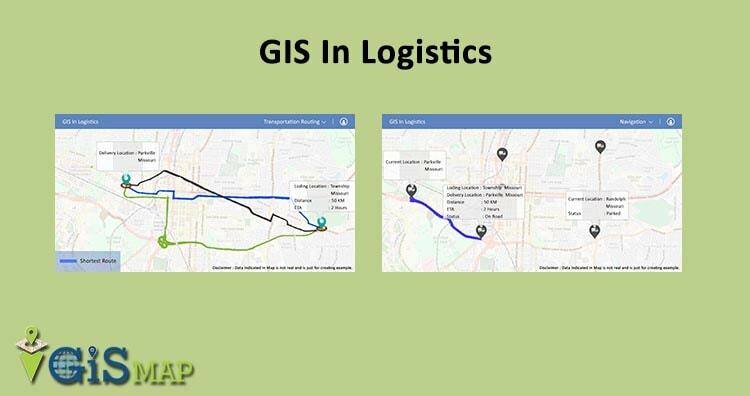 The help provided by GIS in Logistics is performing all these tasks efficiently. Lets move further with the briefing of these tasks and the help that GIS provides. 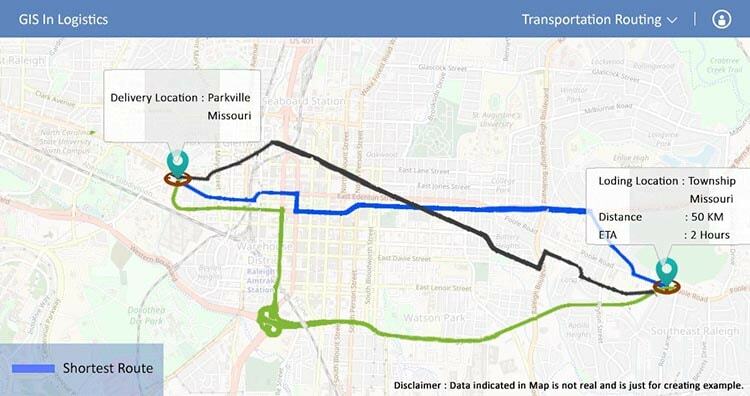 lets discuss these two in a brief that how We use GIS for these two tasks of pre planning. Allocation of the Resources : The First and the Foremost function of the Pre planning is to allocate the resources efficiently. But how? So, whenever we receive a new order we can look for our resources which are close to the location and can reach there to load the stuffs with the optimum efficiency. So, you can do this by using any GIS application like Google maps or any other Customized apps created for the Logistics service provider. Transportation Routing : Providing a service and providing effective and efficient service both are far different having a slim line difference. That is the service is on time , without making any defects to the products. So we can route the resources with the help of GIS applications like maps. 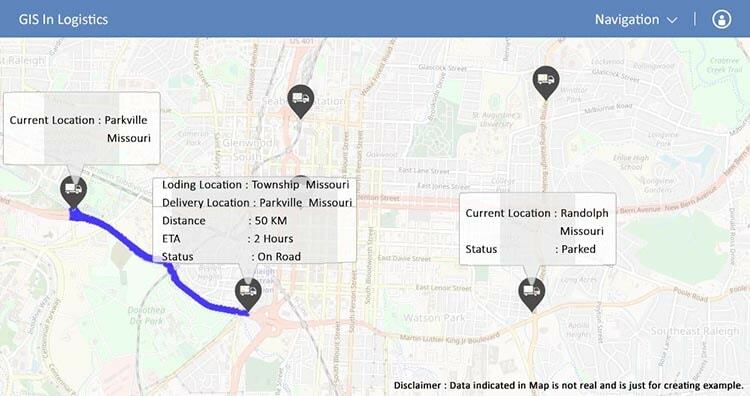 So maps will show you the best route, the shortest routes from loading Location to the Delivery Location. Navigation is again the way to get the routes which we have planned before leaving for the delivery of the products to the respective location. So GIS would be helping the Driver on route to get the navigation according to the planned route. Fleet Management refers to the Management of the vehicle. In logistics Fleet management refers to the Management of the commercial vehicles. Such as – Trucks, Cars, Van, aircraft. So management of these Vehicles includes vast functions like financing, investing , insurance, maintenance. Driver management, speed management, health and safety management and last but not the least is fuel Management. GPS Tracking : GPS Tracking is a useful tool for the admin and the customers. Gone are the days when the admin used to call the driver for getting their locations updates, but now there is no need of calling to the driver and getting the updates. As GIS would do that for Admin and customers, they can easily get the location of the Vehicle in real time with the help of GPS devices wich are inbuilt in the vehicle. So this decreases the chances of be fooling the admin or customers. Vehicle finance : Vehicle finance refers to the monetary aspect of the logistics. This includes the amount of investment in a vehicle in the form of its maintenance, insurance, fuel etc. All these factors make a budget for the individual trips of the vehicle. As according to the budget they cost their customers. So Budget has to be very specific and accurate. For making the accurate budget GIS can help you. As you can locate your resources and can send them according to the locations, such that you can calculate the cost by calculating the distance and the estimated time of all the options Available and can send the vehicle according to your preference, that is the one which costs least. GIS leads to the cost efficiency of the company as they can decide the routes according to their choice of either having or not having the tolls in the route, by choosing the shortest route for the transportation. Shortest route will save time, so the another trip can be arranged in the remaining time, fuel would be less consumed for the shortest routes. Now that we have discussed every feature in which we can use GIS in Logistics. So, we would like you to share your views and experience with us by commenting below in the comment box. Suggestions are welcome.